Korea's hottest street food is here! Korea’s famous hot dogs have arrived in the United States! 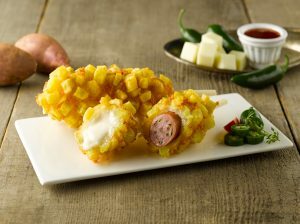 Unlike your typical hot dog in a bun, we specialize in using a stick to deep fry our signature item until it crisps golden brown. 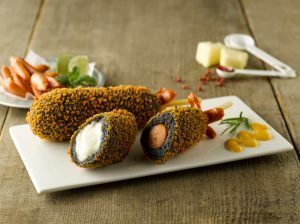 It’s the perfect snack filled with your choice of mozzarella cheese, squid-ink, rice cake, potato, and more! From selecting various appetizers to choosing the right sauce to finish off, Myungrang Hot Dog offers a fresh and delicious treat. Myungrang (pronounced myung-rang) means cheerful, playful, and bright in Korean. Myungrang Hot Dog strives to bring a positive and delightful experience for our guests after each bite of our signature hot dogs! Myungrang Hotdog new menu review! © Copyright | All Rights Reserved Myung Rang USA, Inc.